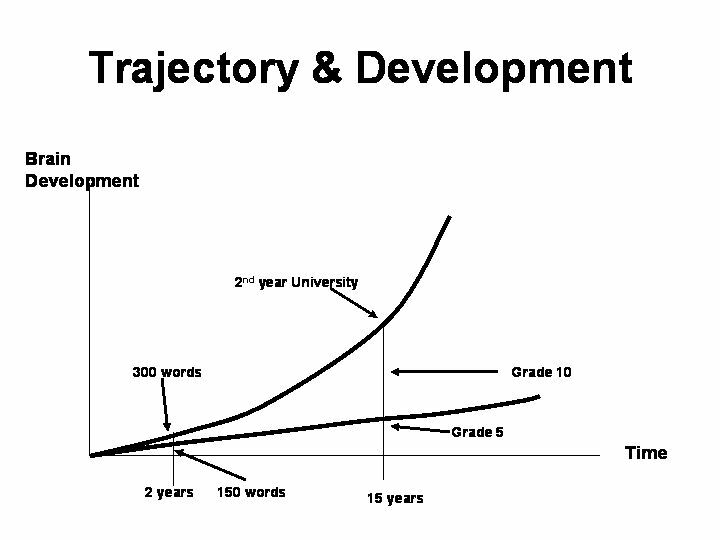 What is the power of the Vocab Trajectory? It compresses all the huge complexity of all the interactions and gives us one measure that tells us in the right time frame where we are and what more we need to do. When they were building the Confederation Bridge, the project manager and the funders demanded a set of measurements that would enable them to see if they had the full complexity of the project in hand and to let them know if they were on track to complete on time. 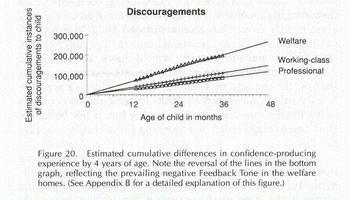 They had the same problem as we do in measuring the impact of many complex factors and interactions on the Early Years. They chose one measure. The Foot Poured of Concrete per Day. Why? Because to pour a foot of concrete, everything prior to that had to have been completed. The full complexity of all the hundreds of interrelated steps had to have been pulled off well. Foot poured would also give the engineers and funders a clear view of the trajectory of the work. They could still change elements in the mix to get them back on track. 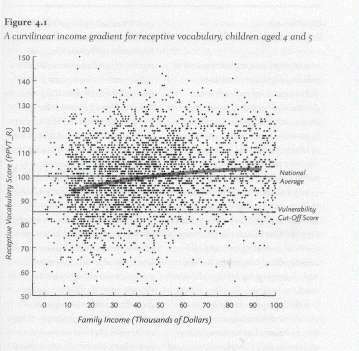 This is the power of the Vocab measure. What do we know about the key elements that give a high score on vocab at age 2? We know that it is largely determined by three factors. The most important is the number of words heard in conversation by the infant. The second is how much the infant was touched. The last was the quality of the interaction between the parent and the infant. 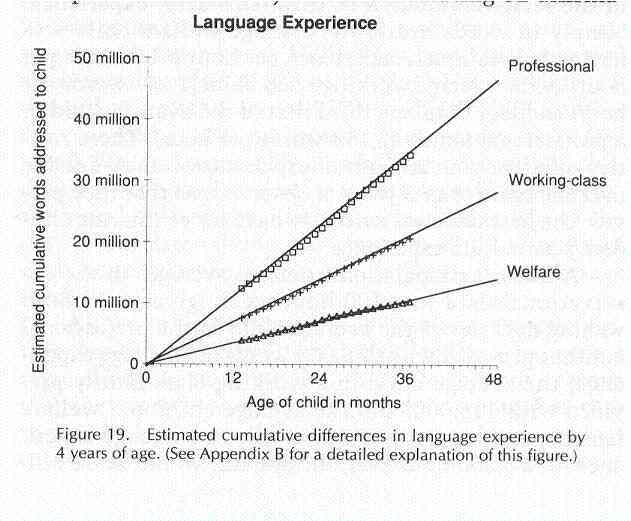 Hart and Risley - Meaningful Differences in the Every Day Experience of Young American Children has explored the words and culture aspect of this driver. 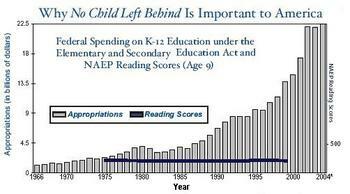 Here is the core finding. The brain and outlook of infants is moulded by the experience of language itself. Like any moulding experience cumulative experience counts. 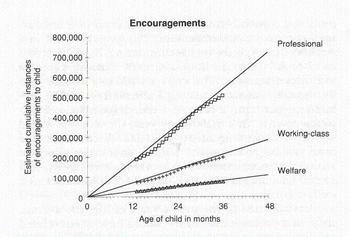 By 4 the children in the Professional Family group had heard an accumulation of 50 million words. The Welfare family children had heard only about 10 million. A 40 million word difference! 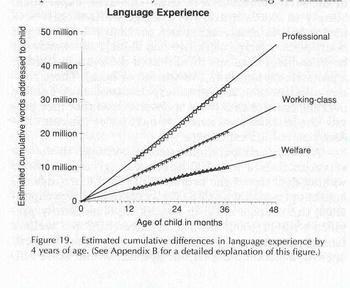 By 4, the language pathway has almost closed and while a child that has heard only 10 million words can speak, it lives mainly in an instrumental world. Its ability to perceive the symbolic world, which is now the core of our society, is very small and the opportunity to add back 40 million words is not possible. 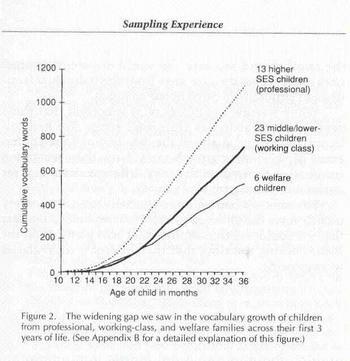 Many 4 year olds from a high talk family have a wider vocab than the parents of the welfare child! The last meaningful time to intervene is at 2. The best time to intervene is at birth. 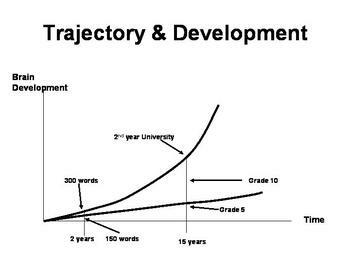 Of all the developmental factors, H & R and Wilms feel that the amount of language heard in conversation is the single most important driver for opening learning pathways. I emphasize in conversation. The context for hearing is relationship. Humans connect with each other in two ways by touch and by conversation. 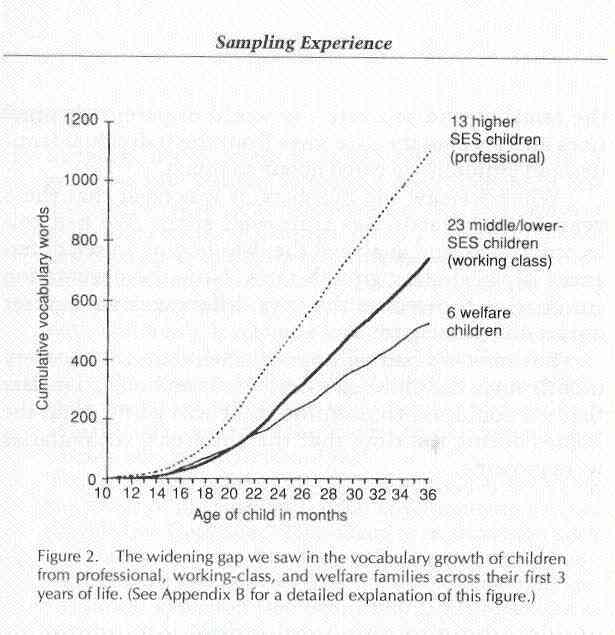 Dunbar makes the case that language development itself was an extension of primate grooming over distance. Babies do not hear TV, they hear their mothers in a dance of intimacy. There are some qualitative issue as well. There is a very large cultural gap embedded in vocab which is the nature of the discourse. Wilms's research is clear. 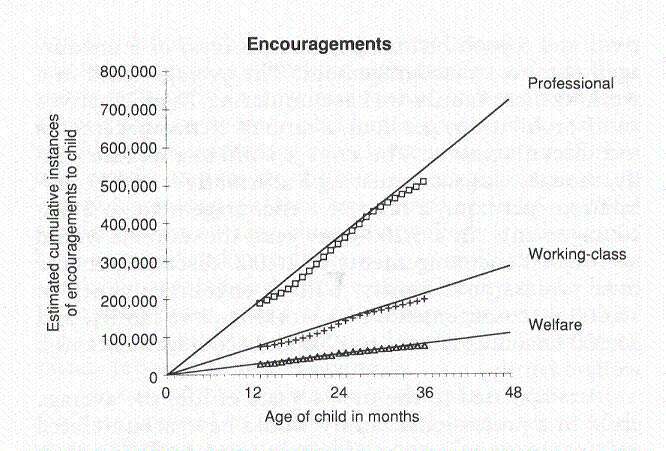 That Authoritative family culture - nice but firm is the most effective. This slide shows the significant difference between cultures in the positive aspects of discourse. Families in an instrumental world tend to focus language on the does and don'ts - mainly on the don'ts with little or no context or interaction. They "see" their children as objects or instruments to be cleaned, fed and controlled. They themselves are often objects in the workplace whose destiny and welfare is objectively "managed" by a larger parental figure such as a boss or the government. No one consults them or asks their opinion. They are not trusted and have no public power. Recent tragedies such as Columbine have been centred in middle class settings. What is going on there? Many middle class parents both working full time are exhausted and feel guilt. While they have the symbolic verbal skills, they have lost the energy to form strong attachments. They too may have been captured by the instrumental world of a bureaucracy. They have become objects as well and risk being "corporate" at home which then becomes a task centred culture. They may react to their circumstances by being very permissive and not providing enough structure. They may have a nanny from the developing world who will seek the easy life and be permissive or be inattentive and allow TV to be the primary interactive agent. The nanny may herself come from an instrumental culture where the instrumental aspect of care overshadows the emotional and connective aspects of the underlying relationship and the need for conversation. 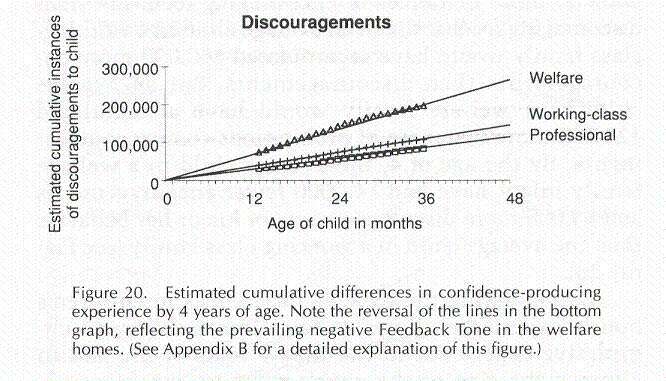 The issue of development in the early years at its deepest level appears to be framed in terms of the parent child relationship which is in turn framed by the culture of the parent. We pass on our culture to our children when they are most impressionable - when they are new born and until the age of 3-4. In the context of the trajectory and words, touch and culture, what might be the big 3 items that would empower parents to ensure that their children have the best potential to learn and grow though life? How then could we help all parents obtain this insight and how could we help them obtain the skills? We are recommending that we design and build a network system of knowledge that supports each family in a way that suits the unique needs of each family best. How might we do this? See Building the Network for the final section of this paper. So what do we do with the idea of helping parents prepare their children to have the largest possible vocab by 2? How do we use our knowledge that the best way to reach this goal is by having more interactive conversation and by using more touch to create more attachment? The immediate response, drawn from our industrial conditioning, might be that we need to create new institutions to "help" parents. After all this is how we have organized schools and how we organize the support services for social services. We think that taking this route is a fundemental error. We think that institutions as we "see" them today have had their day. They tend to evolve quickly into self serving monoliths. They accrue structural cost growth that exceeds their capacity to deliver the service well. So they bleed the customer interface. If you don't agree with me, then think of schools today with their huge "supporting" bureaucracies and a front-line that has become a battleground of stressed teachers and acting-out kids. Think of how we deliver healthcare where stressed-out healthcare workers hand out prescriptions but do not have the time to think about why we might be ill. Think about the service side of the private sector where you get the run around from the support folks such as when you last phoned the phone company for support and got the dreaded recorded voice telling you that we value your custom but all our people are on the line (or in meetings) and asking you to wait for someone in a cubicle in a call centre thousands of miles away. Conventional institutions have become authoritarian organizations that do not listen and have taken away the voice and the sense of control and hence worth of their employees. Everybody suffers including the customer. Networks such as eBay are different. They involve the communities that they serve and set up the conditions where people can help each other. They listen intensely and they build trust by giving their employees and most importantly their customer significant control. They have exceptionally low direct costs in inventory because they don't push product out, they respond to client needs. They have exceptionally low indirect costs in that they have the internal responsiveness and flexibility to make good decisions very quickly when faced with changing circumstances or the advent of new ideas. This is the type of help and support I think parents find is attractive. This work is all about relationships and culture. If we seek to shift parental relationships from authoritarian and permissive to Authoritative and Collegial, then the culture of the support mechanism has to be culturally aligned to also be Authoritative and Collegial. There is no compromise on this structural point. So this then is the work that we are going to explore in the next few months. 1. Content - Words- What are the best methods that a parent can use to significantly increase the amount and the quality of their conversation with their babies in the first 3 years of life. How can we set up the habit of dialogue when the parent came from a family culture where their mother did not do this? How might reading help? What outside help for the parent works best? We know from the area of addictions, of weight loss of personal fitness that changing the habits of a lifetime on our own is impossible. What then might be the role of a personal coach? What might be the role of a local community support group of fellow parents? 2. Content - Touch. In our busy world where so many women work and where we have been conditioned to think that we are spoiling the child by holding them too much, how can we find practical ways of significantly increasing the amount of touch? How will seeing breast feeding in the context help? 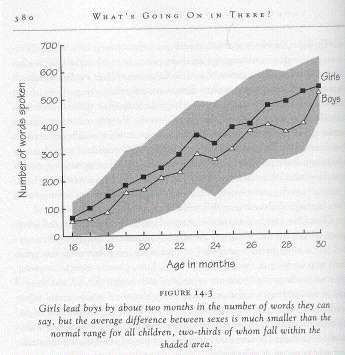 How might reading be seen in this context? 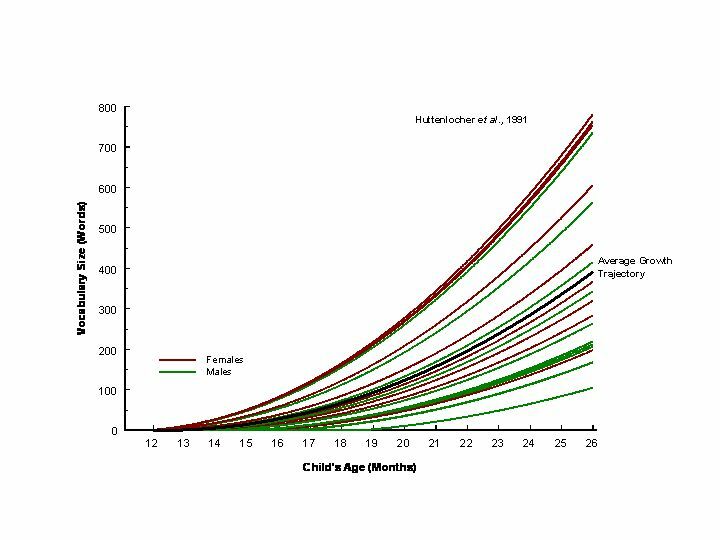 What about co-sleeping with our infants - what are the real risks/benefits? How do you then make the break? 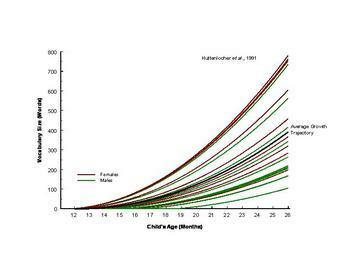 What about the use of slings and pouches versus strollers and car seats in a busy world? What about mothers who have a year off for maternity leave? 3. Content - Attachment and Culture. What do we mean by Authoritative Parenting style? If a natural style is authoritarian or permissive - how can we make adjustments? How can we help parents notice and react instinctively to the cues that our infants send us - in effect, what is baby language? How do parents cope with the opposing cultural influences of their own parents and grandparents who may think that what they are doing is wrong? 4. Social Marketing There is no one message or one method that will fit every parent. The age of mass marketing is over. What then are the messages and the channels by which we will reach a wide range of parent cultures and families. How can we reach business and government so that they "see" what the stakes are and how they can best help. Can we use the lessons of the Tipping Point as a low cost high yield process? Who can help us here? How can we use technology, such as how eBay works, to connect parents in authentic community and to link parents to trusted coaches and information so that they can teach and help each other as peers and in communities of practice? 5. Training - Train the Trainers. Who will be the coaches and what will they have to know? How will they be Branded/certified? How will they remain current? How will their learning flow back into the larger knowledge pool so that we constantly build up the pool of Intellectual Capital that supports this work? 6. Research - Accelerating the interaction between action and research How will we link what we do in the field to the growing research effort on the Early Years? How do we do this without adding too much friction to the work? How can we get results that are meaningful quickly so that they can be fed back into the system and changes made? 8. How will we design and operate the network? Form follows function. We are fortunate in having some early exemplars of community based organizations such as eBay that are built on the platform of creating the right space for trusted relationships. If you want to know more please follow this link. Can we fix Agriculture by a focus on how we do it or by seeing the system? can be bought for $50 now but a DVD film costs $20! you will be able to download most movies as well. processing will come to the fore. everyone except the developing world now grows a lot. dies so will this business. message across - what would you do? 6. A tip. People find it hard to grasp concepts alone. system on PEI and let farmers and consumers choose. I heard the Bishop of PEI opine tonight - unkown terrors will befall us if we allow Gay marriage.